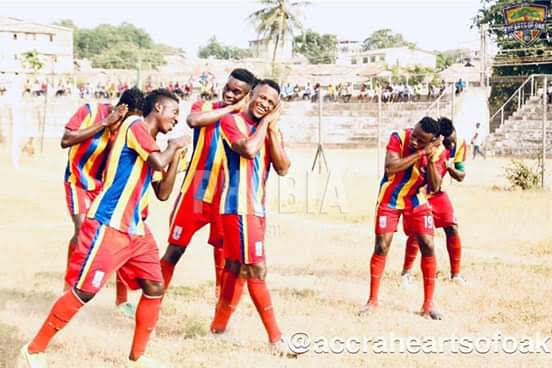 Hearts of Oak's resurgence under new manager Kim Grant met a different test as Pacific Heroes scored late at home to deny the Phobians their sixth consecutive victory in friendly match played on Sunday. The host, Pacific Heroes, had vowed to stop the rainbow boys from continuing their off-seasonal dominance and it came to pass. Kwadwo Obeng Jnr headed the Phobians to the lead in the 21st minute Fatawu Mohammed's corner. Obeng Jnr twice threatened to add another before the break, while Joseph Esso also had chances in an opening half dominated by the visitors. GoaLkeeper Richard Ayi protected that lead with a number of early saves, while the defense men stood tall to foil several attacks made by the Heroes. But with seven minutes to end the game,Christian Aho earned the host a point with a close-range finish from a well taken comer kick. It was just the second time Kim Grant's side had been held in a draw in 13 matches, showing signs of improvement in Hearts of Oak setup. Their only defeat came in a 2-1 clash with Royal FC at Pobiman.